Last week, the Western New York Land Conservancy and Friends of Jackson Falls received notice of a $20,000 grant from the Gallogly Family Foundation to help save Jackson Falls in Aurora, N.Y., and turn it into a nature preserve. This grant is a challenge gift, which means the community must step up to match it, dollar for dollar, in order to for it be used towards creating the Jackson Falls Preserve. But there’s a twist: a single donor must match the entire $20,000 challenge gift. That donor will have one of five benches to be placed at the preserve named in their honor. As a special bonus, those five benches will be hand-crafted by Roycroft Renaissance Master Artisan Thomas Pafk, who is also a neighbor to the Jackson Falls property. Only two of those five benches are still available to donors of $20,000, so time is of the essence. 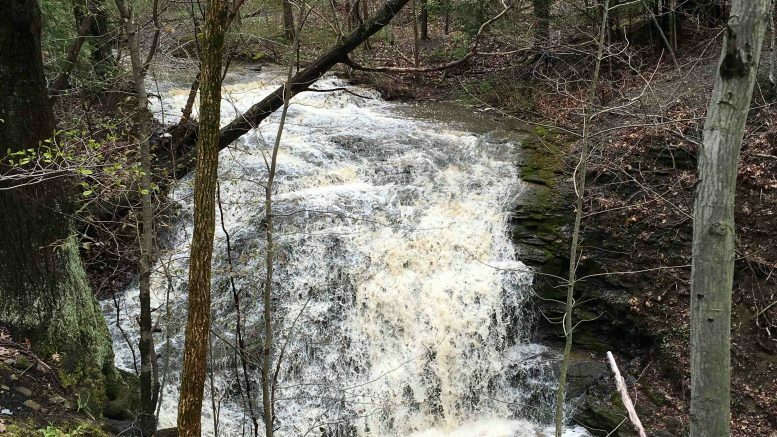 Jackson Falls, a 57-acre property between Center Street and Hubbard Road in the Town of Aurora, has two gorgeous waterfalls, a deep ravine and mature hemlock forests. It is home to migrating birds, breeding frogs and salamanders, and rare wildflowers. Its forests and wetlands are natural filters that improve water quality downstream in Lake Erie and the Niagara River. Once protected, it will become a publicly accessible nature preserve. The Land Conservancy and the Friends of Jackson Falls, a 30-person group of community members committed to protecting Jackson Falls, have until Oct. 31, 2016 to raise $600,000 and purchase the property, open its trails and ensure its long-term care. If not protected, the land could be cleared and subdivided, cutting the community off from the waterfalls. Fortunately, they have already raised more than $400,000 of the $600,000 needed. In addition to its natural wonders, Jackson Falls is steeped in local history. The Village of East Aurora is known throughout the world for its Roycroft Arts and Crafts community. Elbert Hubbard, visionary founder of Roycroft, often visited the forests and farms just south of East Aurora. He even built a cabin there for longer stays away from the hustle and bustle of the village. A few years after Hubbard died aboard the Lusitania, Cecil Jackson purchased a gorgeous tract of land on a hill overlooking Hubbard’s cabin and the village. Cecil was the son of one of the Roycroft’s earliest workers in the furniture shop, Merritt Jackson. Cecil ran the Roycroft bank and stayed there until 1938 when the Roycroft business succumbed to the Great Depression. While Merritt was one of the first Roycroft employees, Cecil was one of the last. Be the first to comment on "Challenge gift brings Jackson Falls Preserve one step closer to reality"